Lisa has been involved in the Health and Fitness industry for the last 9 years. 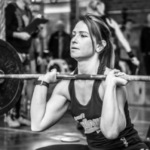 As the wife of the owner and Head Coach of CrossFit Platinum, she started out behind the scenes doing all the administration for Fitness Technologies and CrossFit Platinum. As her desire grew to become more involved in the industry she completed her CrossFit Level 1 Certification. She competed in the 2012 CrossFit Open, and qualified as part of the CrossFit Platinum Team that competed at and won the African Regionals. Following which Lisa joined the Team in representing the African Region at the Reebok CrossFit Games in Carson City, Los Angeles, USA. She is also a qualified sweat 1000 instructor who is always striving to push her clients to reach their full potential.